Aptamil Gold+ 4Junior Nutritional Supplement: 1-2+ yearsIt is important to nutritionally support your toddler’s rapid growth and development. For a toddler whose dietary intake may not be adequate, a scientifically-designed toddler supplement specifically designed for their immune system and brain development can help your child meet their dietary needs. 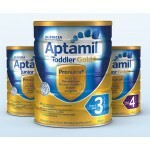 We offer two nutritional toddler supplements (Aptamil Gold+ 3 and Aptamil Gold+ 4).A premium supplement for young children from 2 years of age, Aptamil Gold+ 4 Junior Nutritional Supplement is specially designed to help meet the dietary needs of active or fussy children whose dietary intake may not be adequate. Formulated to support growing children when consumed as part of a healthy and varied diet and prepared as directed.Contains the goodness of cows' milk & 16 essential vitamins and minerals to support normal growth and developmentZinc, necessary for normal immune system functionCalcium and Vitamin D for normal teeth and bone structureContains Omega-3 DHA fatty acidTwo serves per day provides at least 20-50% of the recommended dietary intake (RDI) of 16 essential vitamins and mineralsSucrose (table sugar) free and no artificial colours.Hint of vanilla flavour.Aptamil Gold+ 4 Junior Nutritional Supplement is designed to help meet the dietary needs of young children aged from two years old, whose energy and nutritional intake may not be adequate.WarningsBreast milk is best for babies. Before you decide to use this product, consult your doctor or health worker for advice. Follow instructions exactly. Prepare bottles & teats as directed. Do not change proportions of powder except on medical advice. Incorrect preparation can make your baby very ill. Infants over 6 months should be offered foods in addition to infant formula.It is safer to use Aptamil Gold+ infant formula immediately after it is prepared. Discard unfinished drinks. Product is packed by weight, not volume. Some settling of the powder may occur during transportation and distribution.Store in a cool dry place. Use by the date on container bottom. After opening, keep container airtight and use contents within four weeks.Note for all feed preparations:Prepare each cup or bottle separately. Do not prepare gels, thickened feeds or thickened food in advance as thickness will increase on standing. Discard unfinished gels, feeds or food. ..